NIGHT VISION PUPPETS (tm): Welcome! 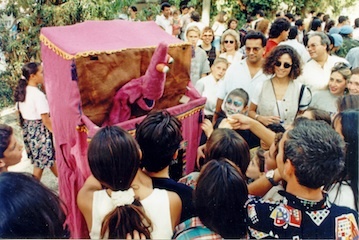 ... is a puppet troupe primarily involved in street theatre and television performances. The troupe was organized in 1974 and has performed in Spanish and English. Live performances usually involve the use of the "walking stage," a framework of aluminum tubes covered with fabric that allows the puppeteer to walk among the audience. Creator / director / performer John Higgins thought he had "hung up the stage" in 2001 . . . but the puppets pulled him out of retirement in 2007. They continue to perform for special occasions every now and then. at the 50th anniversary party of the United Nations, Ledra Palace, Nicosia, Cyprus. October, 1995. A short video clip of the puppets performing at a 2007 neighborhood block party in San Francisco. (2min 25 sec).